It was meant to be inspirational, but when I saw it, I cringed inside. I had been searching for some "wall words" to put over my kitchen window .... a hazzard of spiffing things up a little bit with a dab of paint. Once the lid is off the jar containing all the things I want to do for my house, they all rush to the forefront of my mind. So, this quote was doubly timely. It pained me, physically, when I read it. My heart seemed to pause in my chest while the "danger, danger, danger" alarms sounded deep within. I realize its purpose is to remind people to focus on the goal, and thus attain it. 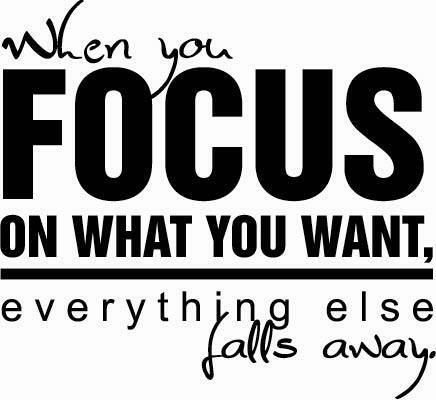 Yet, when I read it, I can't help but move the emphasis from "focus" to "want". And I do believe it is true that when we "focus on what [we] WANT, everything else falls away" - family, relationships, responsibilities, God. Dreams, hopes and goals are wonderful things. I love to dream of the ways I'd like to update, rearrange and remodel my house. 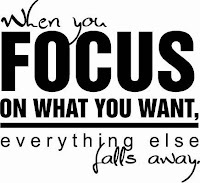 It's OK to "want", but my focus needs to be elsewhere.